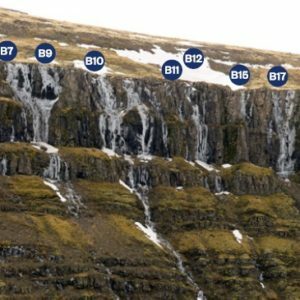 “Þór er bakkelsi” er ný mixleið á horninu vinstra megin við leiðina “Fimm í fötu M5+”. Left route in the “Trinity” in the most eastern part of Kötlugróf. Beautiful and popular routes. Right route in the “Trinity” in the most eastern part of Kötlugróf. Beautiful and popular routes. Bolted overhanging mix climbing route. Traverses left under a big roof – real piece for hard heads!. 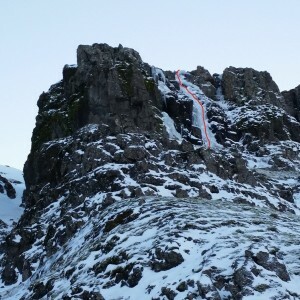 First bolted route in Múlafjall. The route was named after the drinks that were drunk during the climb. Upper part it hard to climb if there is no ice and you might have to use traditional protection above the bolts. Icicle up from Drjúpandi. 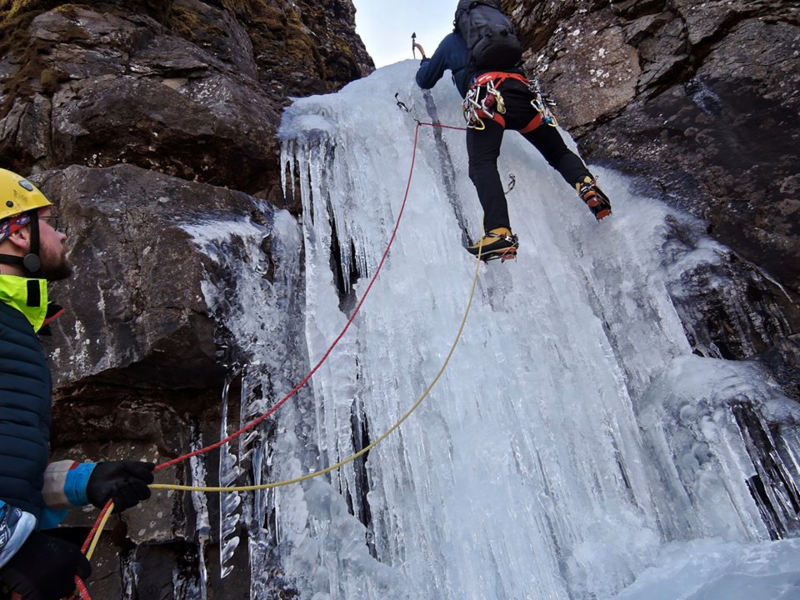 Climbed by Palli Sveins and one of the most famous ice climber of that time, Guy Lacalle. 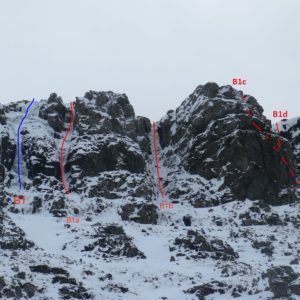 Popular route, left side in a big circ, a little bit east of Íste. 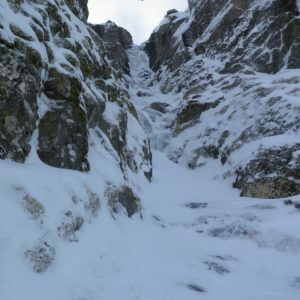 Steep first part, often with a thin icicle mid way up. 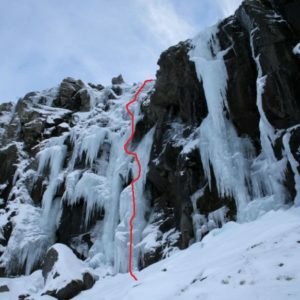 Unrepeated route with hard mix climbing in the start. Middle of the Fjúkandi circ. Very nice route! Starts on a short but steep step, maybe 5m to a small snow slope/ledge. From there the later half is quite a bit longer and more sustained. First part can be tricky if there is not enough ice. Later half might also be WI 4+ in some conditions. 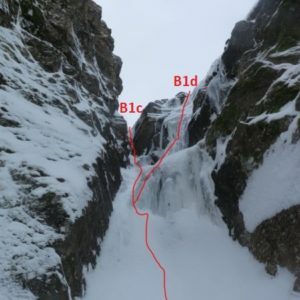 The name of the route translates to: “A good day to die”, if it was like that or not. 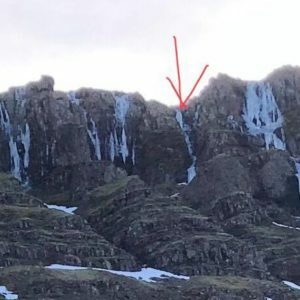 Around the corner from Íste is an obvious roof and about 15m further to the east is a clear light groove in the rock that recently (1998) has collapsed. There is the route. 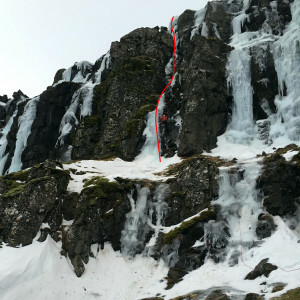 It is obvious, follows the crack for the first 20m, into a small hole in loose rock and then straight up on a little bit of ice. It ends in a small roof with good holds and then to the top. 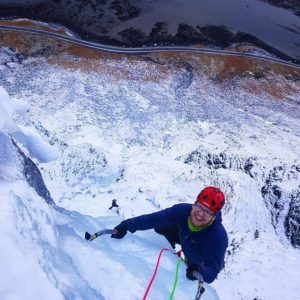 In an obvious icefree crack east of Íste. 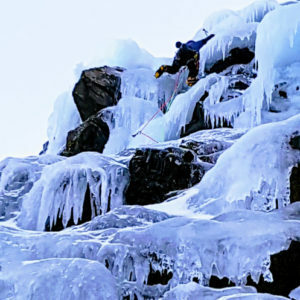 The route ends on ice. Middle route in the “Trinity” in the most eastern part of Kötlugróf. Beautiful and popular routes. one pitch, FA is unknown. 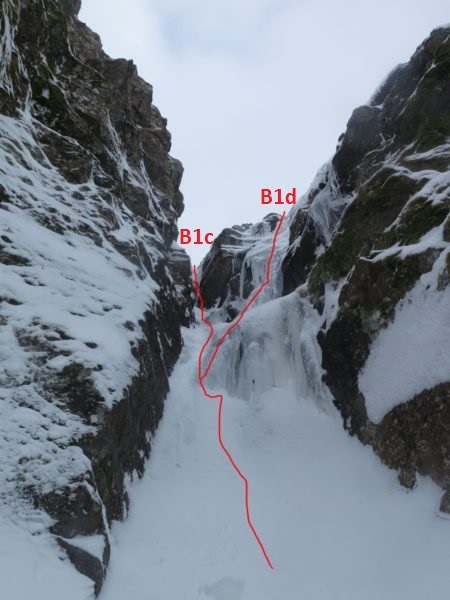 The route gets the name “Svikinn um bjór”, swindled out of beer, in honor of everyone that has been swindled by Palli Sveins out of five in a bucket. Two pitches, first one around M 5 and the other one harder, around M 6/+. 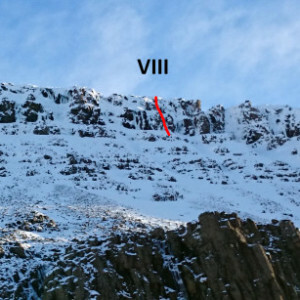 The first pitch follows an obvious crack on the outside of a nose that sticks out, right next to the route Fimm í fötu (2) and the first two meters are the hardest. After about 20m of climbing you get to a ledge, where it is easy and straight forward to make a belay. 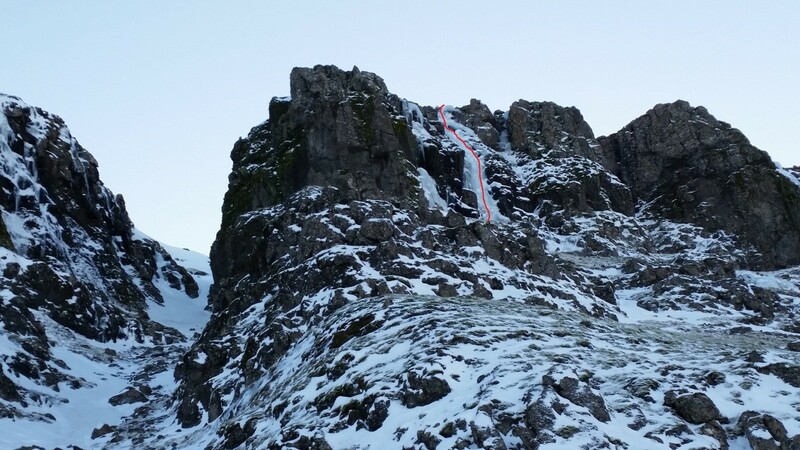 The second pitch goes up to the right from the belay and heads for a very obvious rock pillar, that looks alarmingly loose. Surprisingly it did not move and there is a lot of stuff that’s going to fall down before that one. After that section you traverse over a slab, directly under the massive an obvious roof. At the end og the traverse, you get into a very wide crack in a very flared corner. 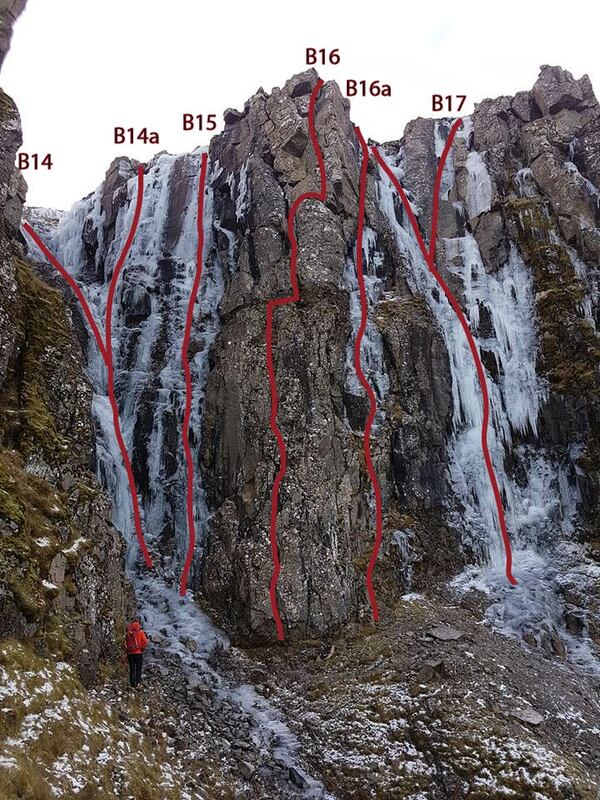 This is the crux of the whole route, tricky axe and feet placements and hard to belay, best option for belay is if you brought along a size 5 camalot but 4 might work as well. After about 3m of this you get easyer climbing, better placements, but the corner is still flared and all movement is tricky, but easier than before. 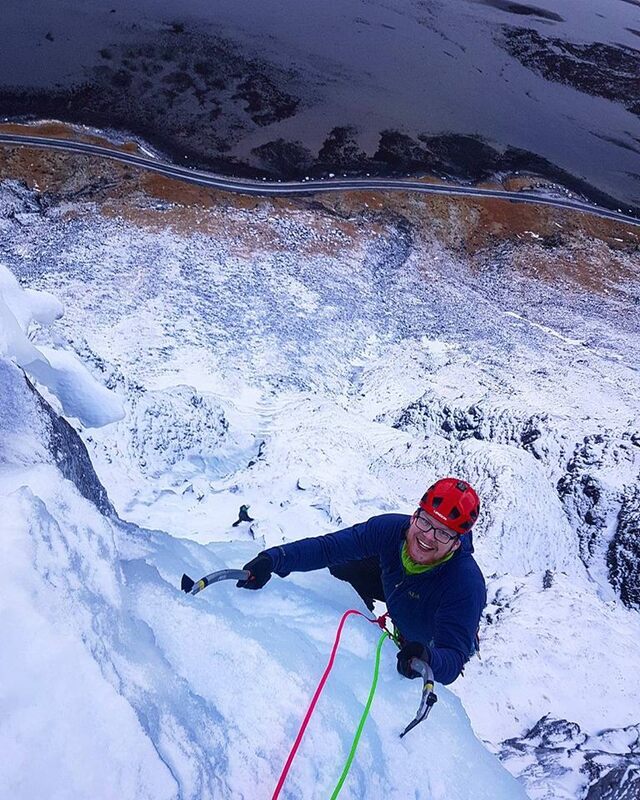 At the top you can make a good belay and also extend it to the top bolt of Fimm í fötu. 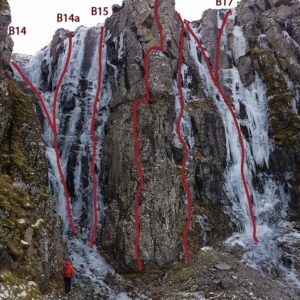 The route was first accented on trad onsight but the plan is to place some bolts in it. It had a lot of loose rock, but majority of it was thrown down, so it should be allright and free of the most obvious hazards. The name is a reference to a debated newly elected president of America, that claims that climate change is just a hoax made by the Chinese. 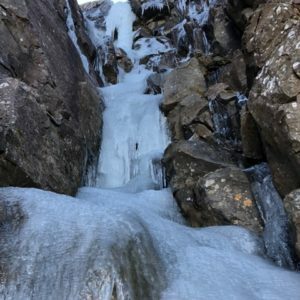 The first accent was done on the 30th of november 2016 in 3°C heat, with almost no ice on either side of the mountain, very unusual for the season. 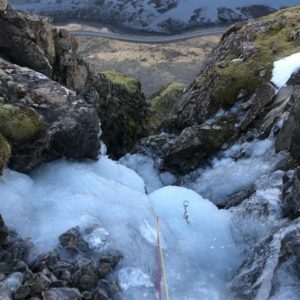 Even though the mixroute is dry, it is best to do it while frozen, it has a lot of moss that makes things easier if it is frozen. 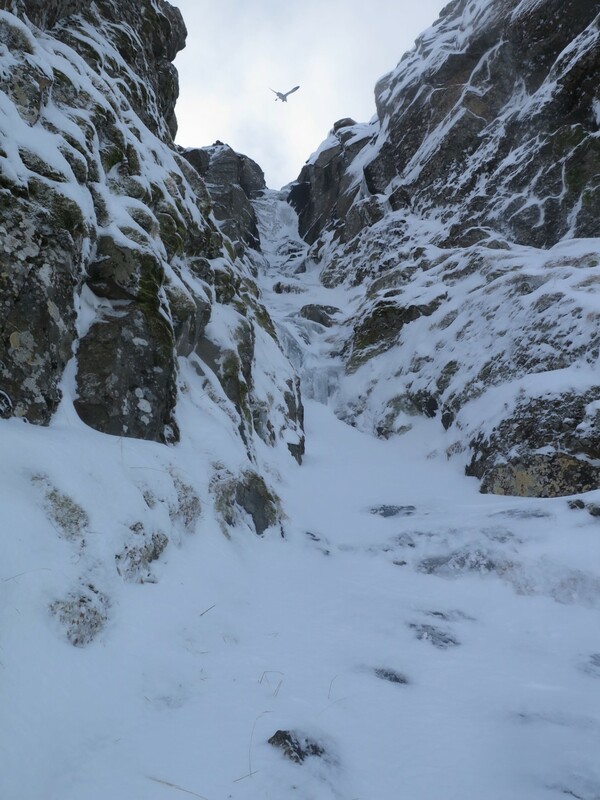 East part of Kötlugróf has a small tight gully with a fun ice route. 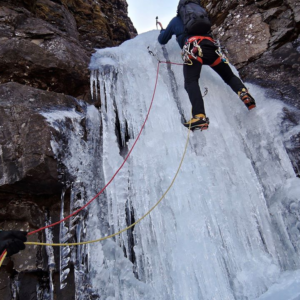 The route varies a lot depending on how much ice is in the route and can the upper part be challenging. In the top part there sometimes forms a large umbrella, that can be challenging. In the middle of the route, there is the option of placing a nice cam in a crack to the side. Can be nice to have 1-2 short screws. 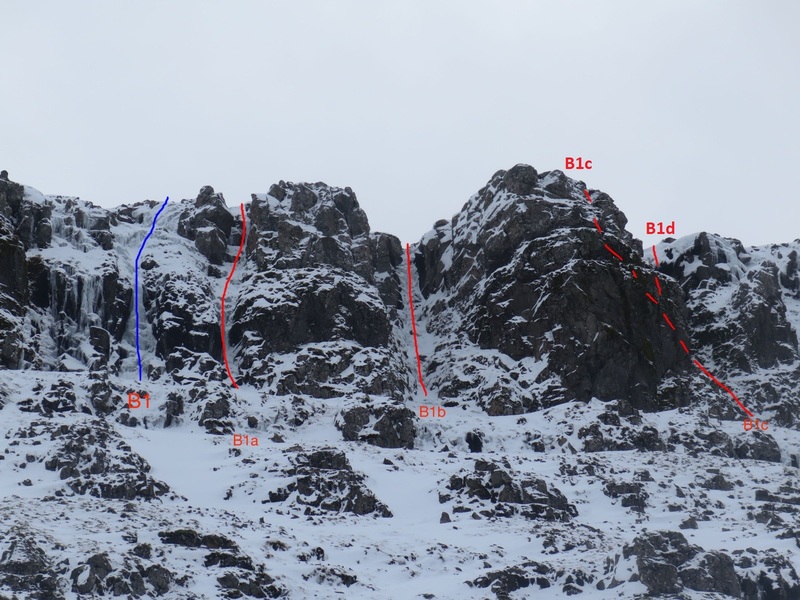 The route is 40m and above there is a rock that can be used for belay, but a snowseat is also possible. The big gully easy of Kötlugróf is good for decent. FA: Arnar Halldórsson og Magnús Blöndal, 30. janúar 2016. 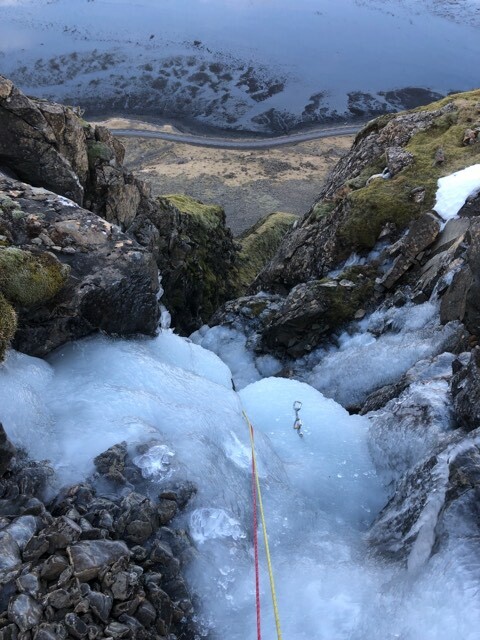 At the east side of Kötlugróf is a nice ice route with a good approach for Múlafjall. The route is hardest for the first 20 m and after that is pretty easy to the top. There is not a lot of options for protection at the top, so a snow seat is an option. Total length is about 45m. Big gully to the east is good for decent. 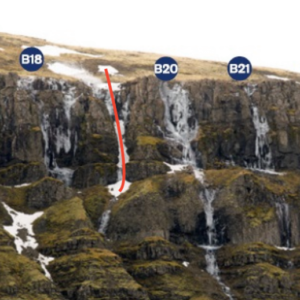 The route starts quite hard (15m) and then there is a steep ice slope up to the left to the final part that is steep and fun. Total length is 45m. There is a big rock at the top for belay but it might be nice to backup. The name Sótanautur comes from a ring that was described in Harðar saga. It is believed that the ring was hidden right below this area. F.A. Arnar Halldórsson og Magnús Blöndal, January 17, 2016. 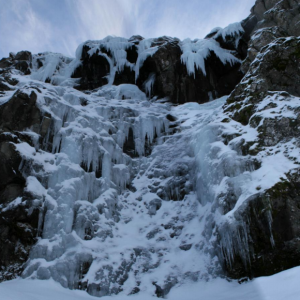 Drjúpandi starts with a 10m waterfall up to a snow slope that leads to the main section. 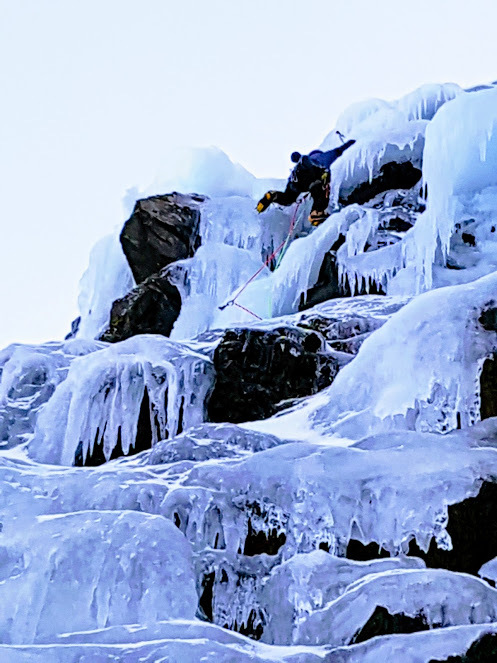 You climb all the way to the rockface where there are big umbrellas and icicles. Total length 50m. Great route for beginers because you can traverse to the left where the route is easier. Decent is on a V-thread. FA: Arnar Halldórsson og Magnús Blöndal, January 17, 2016. The route follows a corner, 200m east of Íste. 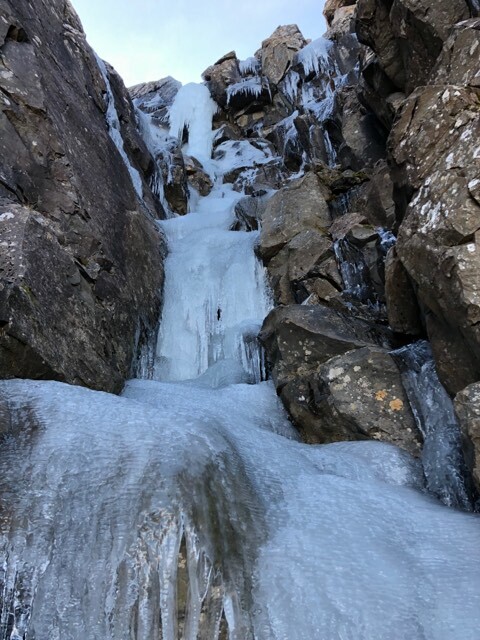 The start is 5m vertical ice, that leads up to steps of ice and moss in a circ. 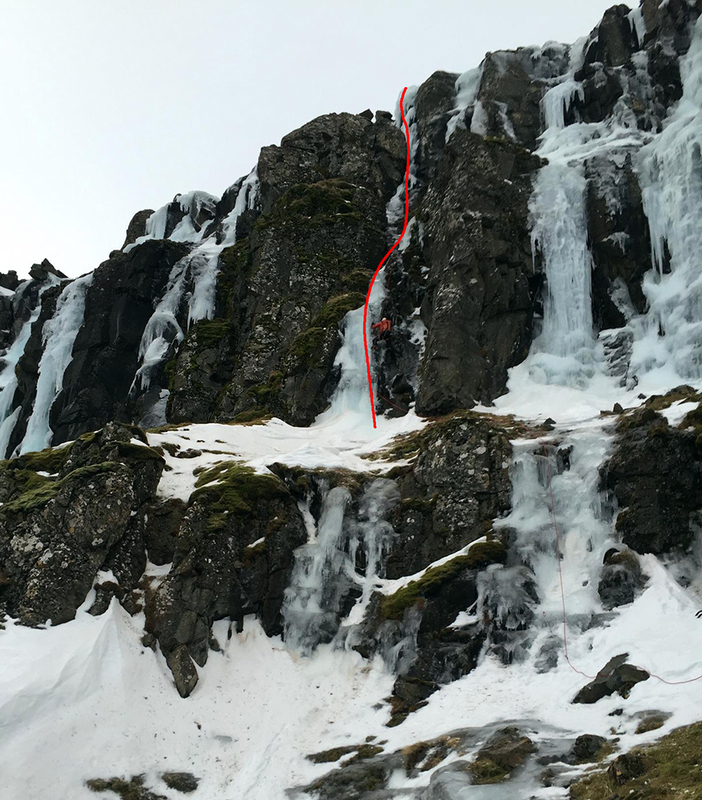 From there you have a couple of options but the route follows a narrow band by the left wall, that leads through a meter wide crack and from there to the top. Physically not hard but offers a few fun moves and possibly some mixed moves. 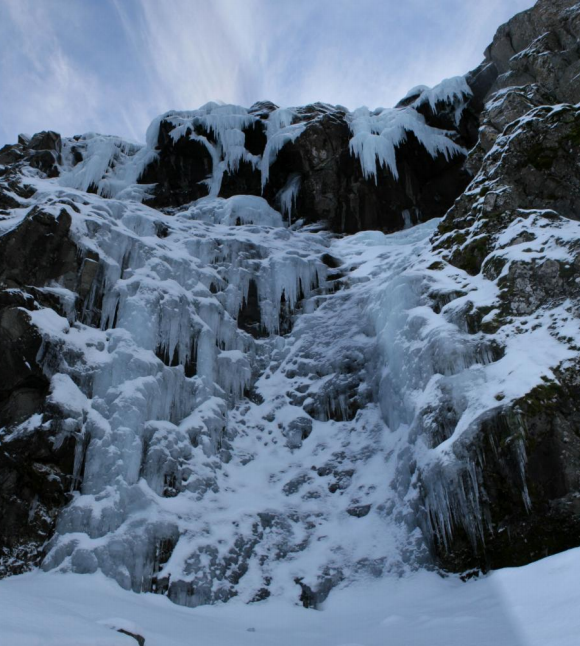 Starts with a 10m steep waterfall, after that there is a snow slope to the hard part. From there is goes to the left and tops out. Total length is about 65m but can be done as one pitch if you walk around the first part. On the top there is only snow and moss for belay. 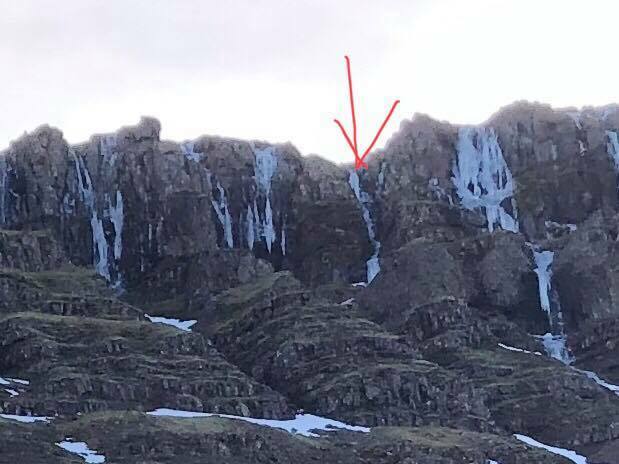 Right side in the second gully after Íste. Obvious chimney in the top part. Tightly bolted and three bolts in the anchor (2 on a ledge and one further up to simplify the scramble down if the tear is going else where TR). 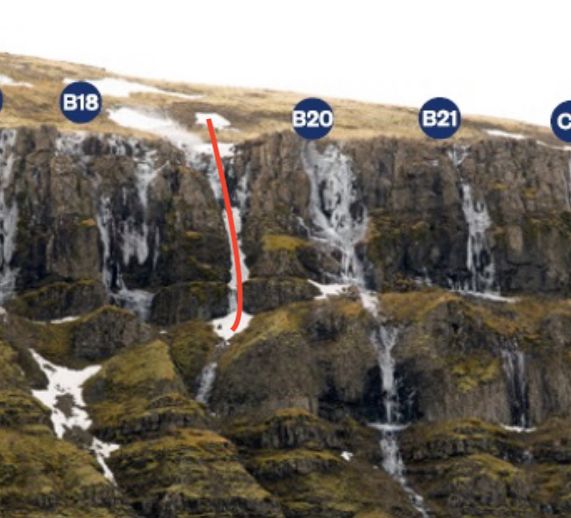 This route was climbed in the middle ages by GHC and PS without bolts.